How does Homestead Law Factor into my Divorce? Are retirement Accounts Part of Equitable Distribution? 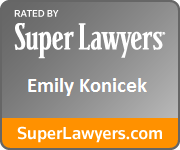 Emily A. Konicek brings 14 years of experience to your family law concerns. Emily excels at mediation, negotiation and litigation, and can help you pursue a course of action that helps you meet your goals for the future and for your family.